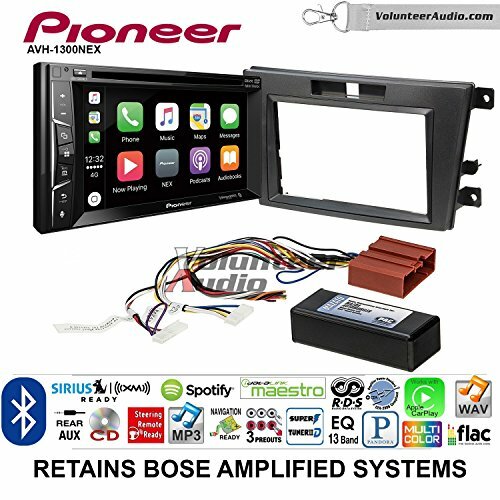 With AppRadio Mode +, Pioneer has taken the technology from our revolutionary, game-changing AppRadio and placed it in the AVH-1300NEX so you can experience control of compatible apps directly on your dash! AppRadioLIVE simplifies your drive by combining the information you need during your commute into a single, simple to use interface. Stay safe and obey local hands-free laws with built-in Bluetooth (HFP). Easily pair a Bluetooth enabled phone to the AVH-1300NEX without having to go through complicated settings. Keep the party going with MIXTRAX®, an innovative Pioneer technology that creates a non-stop mix of your music library complete with a range of DJ-inspired effects. MIXTRAX takes the music from an iPhone, iPod, USB device, or certain Android devices and plays it back with added transitions and effects, creating a virtual DJ inside the Pioneer receiver. More advanced than ever before, NEX features a responsive, powerful and intuitive touchscreen user interface that is easy to use and highly customizable. Connect your compatible iOS or Android™ smartphone with NEX for a truly connected experience, bringing many of your favorite apps right into the dashboard and letting you communicate using advanced high quality Bluetooth connectivity. Apple CarPlay Compatibility. Apple CarPlay is a safer way to use your iPhone in the car. Simply talk to Siri or touch the receiver's display and get directions from Apple Maps, make phone calls, listen to voicemail, send and receive texts, and listen to music all in a way that allows you to stay focused on the road. Bluetooth Hands-Free Calling and Audio Streaming. Stay safe and obey local hands-free laws with built-in Bluetooth (HFP). From hands-free calling, wireless audio streaming (A2DP) with artist, album, and song search, simple pairing, and control audio (AVRCP), Bluetooth wireless technology has made life in the vehicle much more convenient. SiriusXM-Ready. Your Favorite Stations Wherever You Go, Wherever You Are. You can get over 140 channels, including commercial-free music plus the best sports and live events, comedy, news, exclusive talk and entertainment. SiriusXM programming is received through the SiriusXM Connect Vehicle Tuner (sold separately, SiriusXM subscription required). If you have any questions about this product by Volunteer Audio, contact us by completing and submitting the form below. If you are looking for a specif part number, please include it with your message.